We, iSpatial Techno Solutions (iST) an ISO 9001:2015 certified organization, having a nearly decade of experience in the area of Information Technology Planning, Program Management, Solutions and Services. Head Office is located in Hyderabad, India. We have successfully delivered solutions and services to our clients across the globe by collaboration with international partners. Founder members have held prior leading positions with leading firms in the IT industry. iSpatial Techno Solutions started with a vision of providing Smart Solutions to automate the business process into Software Solutions. We have successfully built the Geo-enabled Rapid Solution Development Platforms, which helps to quickly deliver High-quality Solutions with Optimized Cost. We have successfully built Smart Solution Frameworks, which helps us to deliver value proposition to our clients in the area of Location-based Geo-enabled Solutions (both 2D & 3D GIS), Web/Mobility Solutions, Business Analytics, Business Process Automation & Enterprise Integration Solutions. Our Innovation Team is also working extensively on building solutions using Envision Technologies, such as Artificial Intelligence (AI), Deep Learning, Augmented Reality (AR), Virtual Reality (VR), 3D Solutions, Automation & Big Data Analytics. Our Key achievements include execution & successful delivery of complex projects to our client by saving cost & time, with high quality standards. We are very keen in finding the right opportunities & suitable candidates, architecturing solution framework, meeting project timelines & our commitments. Our clients got 5 major international awards for the solutions that we have implemented. Our solutions have been delivered for Government Sectors, Oil & Gas, Utilities, Transportation, Insurance, Banking, Property Development, Environmental, Educational & Healthcare verticals. We design and develop enterprise level Internet/Intranet business applications. Our services fall into one of the following major categories. iSpatialTec serves a wide spectrum of industries ranging from Government, Security, Utilities, Oil & Gas and much more. 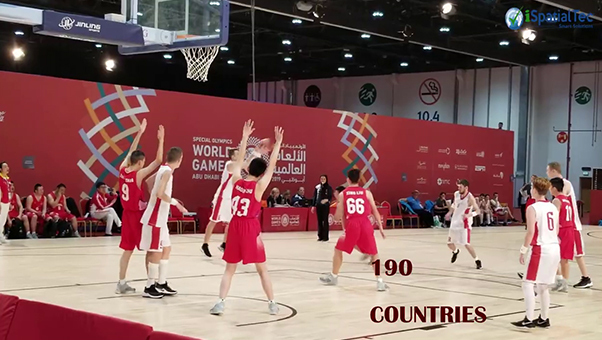 Special Olympics 2019 is the world’s largest humanitarian sporting event which focuses on the empowerment of People of Determination with intellectual disabilities through the power of sport. iSpatialTec, in association with ADSSSA is proud to support this initiative by developing GIS integrated web design using Esri technology showcasing Special Olympics Story Maps, Athlete Information & analytics, Sporting Venues in 3D, Real-time Torch Run & Medals info. We are thankful to Special Olympics World Games 2019 for showcasing iSpatialTec as Official Supporter. Happy to share another year of successful journey for iSpatialTec, the major force behind this achievement is the collaborative teamwork of our team. Thank you team, our clients and all our well wishers! iSpatialTec Congratulates all the Award winners for the year 2018. May you continue to achieve further success in the coming years. We are happy to share that our ArcGIS Story Map titled 'Heavy Traffic Flow vs. Road Accident Hot Spots in the City of Hyderabad, Telangana, India' was recognized under the Category 'Culture / History / Events' by esri India during the 2018 User Conference. BrAeIn Smart Intelligence has all the capabilities of Artificial Intelligence (AI), Business Intelligence (BI) & Location Intelligence (LI). It is a smart Internet of Things (IoT) analytics & AI-based solution, which helps to build Live Monitoring Intelligence Dashboards & generate Predictive Analytics, utilizing deep learning algorithms, automatic voice recognition & patterns analyses from historical data. We are happy to share that, iSpatialTec is an official ESRI’s Emerging Business Partner. It will enable us to provide high-quality Geospatial Services to our Clients, get access to latest ESRI’s Technology, Resources, Training & Involvement in Partner’s Collaborating Events. Thanks to our Team & ESRI’s Team for building successful partnership relations. Mr. Ravi Kishore Varaparla (Delivery Head, iSpatial Techno Solutions Pvt. Ltd.) in an interview with Business World, sharing the Vision of our Company including Current Projects, Client-base & Future Roadmap during esri India User Conference (New Delhi, 2017). Being a Microsoft Partner & having access to the latest Microsoft Technologies & Resources, we aim to be one-stop Systems Integration Provider to streamline all IT software & hardware systems that helps in business growth. iSpatialTec is happy to be a part of Esri Partner Conference 2019 at Palm Springs, California. It was really exciting to meet delegates and explore the latest technology trend. Today, iSpatialTec celebrates the courage, confidence and courteousness of all our female employees who make it happen every day! You all deserve more than Just a Day!! Happy Women's Day 2019 to all the wonderful Ladies out there! Our company’s strength and success depend on our people. They spend many hours of the day together and we want to make sure that our work-place helps them maintain or even improve their health. Good health is a resource that helps us all meet our goals. iSpatialTec ensures everyone to live healthier and happier lives, both at work and at home. iSpatialTec's Management Team presented Smart Asset Management Solution to peers from the global user community at the Middle East & Africa (MEA) region’s largest GIS conference. iSpatialTec actively participated as an Exhibitor, as well as presented its Energy & Utilities' Services Portfolio to International Delegates at this industry-leading event, where professionals from Electric, Gas & Telecommunications Communities converged to network, collaborate & learn. iSpatialTec's professionals presented Smart Permitting Solutions at GITEX in collaboration with The Geographic Planning Collaborative (GPC) Group & Huawei Technologies Co. Ltd.
iSpatialTec's professionals attended esri India's User Conference 2018 at both the Delhi-NCR & Hyderabad Locations. Also, introduced our novel product 'BrAeIn' under GeoInnovation Acceleration Platform & Lighning Talks Sessions to the Indian GIS Community. Our Senior Management actively participated in ESRI UC 2018, demonstrated our solutions & presented our New Product 'BrAeIn' to international delegates. Staff members of iSpatialTec actively participated, interacted with Clients & demonstrated our products. iSpatialTec got an opportunity to actively participate in GISEC IOTx. It was really exciting to explore AI, Smart Cities, Cyber Security, IoT, including Blockchain Technologies to address business needs. Demonstrated our Applications & Solutions to 1,000+ ESRI Customers, Partners & Industry Leads from diverse fields. iSpatialTec actively contributed in GITEX. It was really exciting to share knowledge about Envision Technologies to solve a lot of business challenges. Celebrating our cultures ... We all smile in the same language.